Despite not having much time to blog, I have managed to do quite a bit of knitting the past month. I finished a skirt for Emma (hopefully to be blogged soon) and am zipping along on a cardigan for Leah. As you can see from the top photo, I am also making very fast progress on a sleeve, which I started yesterday. 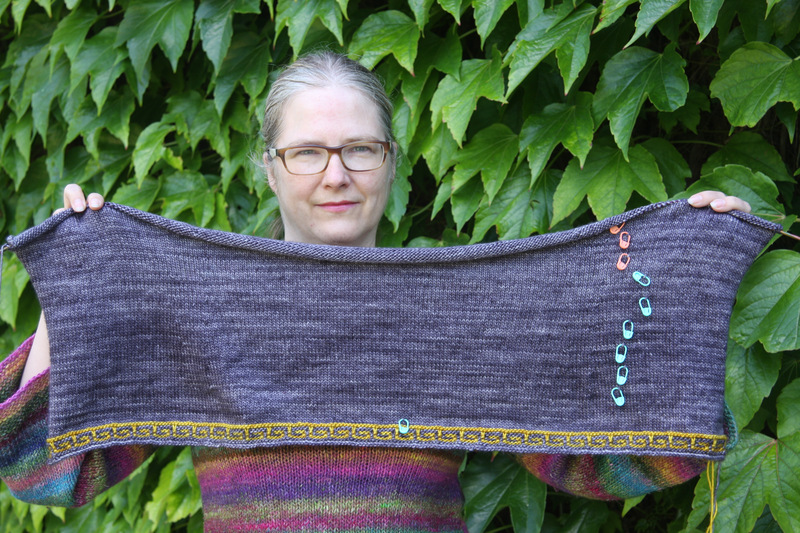 I have often bemoaned knitting sleeves on this blog – in fact I once wrote a post entitled Do you love your husband enough to knit the sleeves?. I find them to be endless and fiddly and annoying. 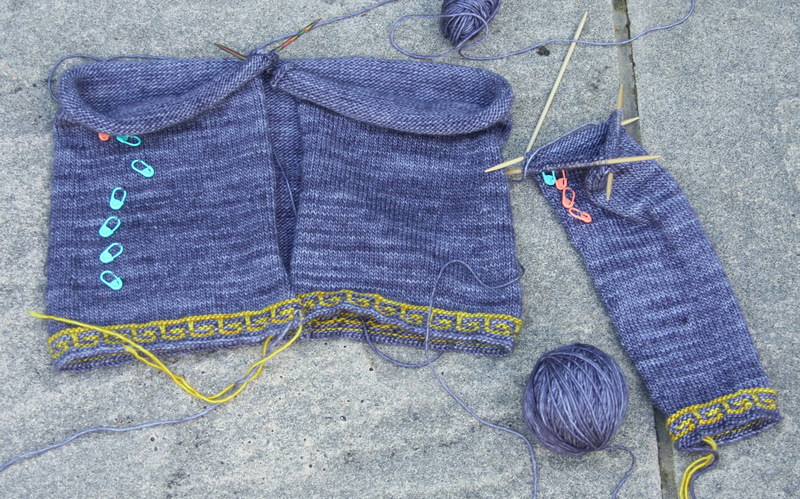 If this sleeve is any indication, however, I should be ready to start the yoke by the weekend. This is my first time knitting with Madelinetosh Merino DK. It is a very soft wool, with beautiful drape, and the colours are very rich. It is, however, a bit splitty and I worry that it may pill. I chose it for two reasons: first because I have long wanted to knit with these two colours – Composition Book Grey and Candlewick (even though it never occurred to me to put them together until I started thinking about this sweater). Secondly, Leah has trouble with itchy wools so I need to be very careful when selecting for her. I’ve knit for her before with Madelinetosh Pashmina to great success. This wool will definitely win points on the softness front. For some reason, I imagined that Peloponesse would be a slower knit. In fact, it is practically jumping off my needles. At this rate, I may just manage my goal of finishing it before Leah returns to Canada later this month. This entry was posted in Main and tagged Knitting, Madelinetosh Merino DK, Peloponnese cardigan, Sandi Rosner, Twist Collective by knitigatingcircumstances. Bookmark the permalink. Oh goodness, it’s beautiful! For some obscure reason, I had a vision about your sweater last night. I was somehow…struck…by the fact you’re going to be knitting the yoke back-and-forth with stranded yarn. Bonus points for you! It’s nice to have a good momentum going on a project. Keep it up! Hi Ann, herein lies the diabolical beauty of this design – it looks like intricate stranded knitting but is in fact a slipped stitch pattern! You never have more than one colour to a row. Easy peasy! I will write about this more when I get to the yoke. Ah ha! I did notice a slip-stitch in the yellow on the border. Brilliant construction! I’m so happy that you’re enjoying my design. I love the color combination you chose, and look forward to seeing the finished sweater. Thanks for commenting, Sandi! It’s a beautiful pattern and I am enjoying knitting it very much.